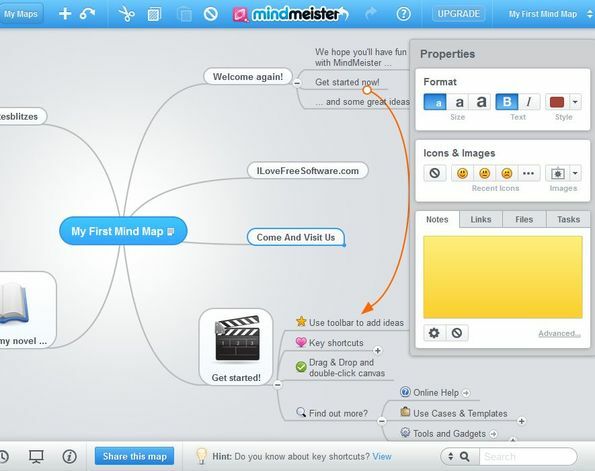 MindMeister is a free online mind mapping software which you can use in order to create and collaborate on mind maps online, inside your web browser. Everything that you need to do is register an account and you can start creating mind maps right away. To develop mind maps you add idea bubbles and then develop them by adding icons, images, text and links. After a mind map is created you can setup a presentation from it, to show the mind map at work or at class. Example of a mind map created with MindMeister can be seen on the image down below. Every mind map starts off with the central theme button, that’s the blue bubble in the middle. From there, by adding additional idea bubbles you develop your idea into a mind map. When you’re creating a new mind map, it can either be blank or you can use one of several available templates. Tools for developing ideas are spread out all around the mind map. Toolbar at the top, additional settings in the right sidebar and options down below have everything that you need for creating mind maps, publishing them and sharing with others so they can collaborate with you. Similar software: Mind42, Labyrinth, Edraw Mind Map, The Brain, FreeMind. 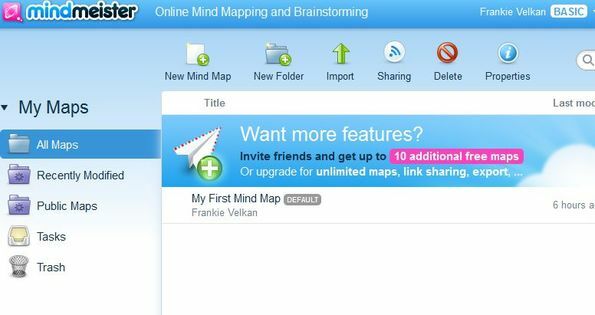 Creating mind maps requires you to have an account with this free online mind mapping software. Registration is very easy, but link for registering the free account is hidden away at the bottom of the Pricing page, so don’t miss it. Paid upgrade allows you to create unlimited number of mind maps, and it gives you various other features. When you register and login, first you’re gonna see the main dashboard where you can manage mind maps. One mind map, the one that can be seen on the image above, is created by default. You can continue editing that one, by clicking on it, or you can create your own by clicking on the New Mind Map Button from the toolbar at the top. Once you click on the New Mind Map button, you can select between Mind Map templates or an empty mind map. Empty mind map will only have the central thought bubble, while the templates are more developed, see image above. To add new thoughts to the mind map, simply click on the Plus button from the top toolbar. To format added text, use the toolbar on the right. Same thing goes for adding icons, links and images to it. 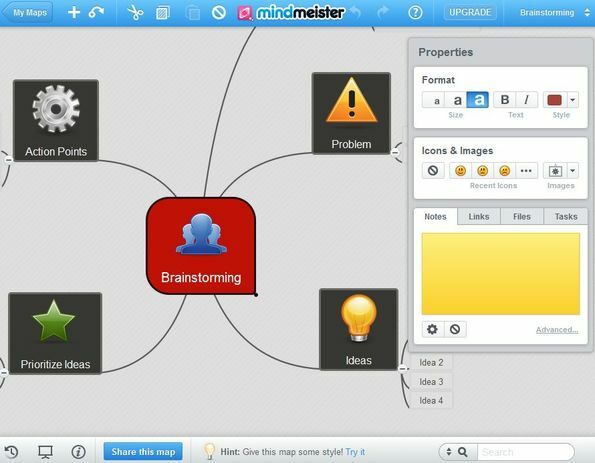 MindMeister is very easy to use and has a lot of interesting ways how you can shape your mind maps. Give it a try and see how it goes. Free registration.